“Behind The Door” is Book One in A. Gavazzoni’s ‘Hidden Motives’ series. It is a suspenseful mystery featuring Simone, a psychiatrist and expert in sexual behaviors, and Carl, a defense lawyer who seeks out her help in a case involving his client who is charged with murder. Carl wants a professional opinion from Simone regarding the case and only provides her tidbits of information in the form of a journal. I found the book quite intriguing in that it revolves around hipoxifilia, which involves choking someone during a sexual act to get them to climax. Many readers do not like to read about detailed sexual encounters, however, it does occur, and it gives the reader a good concept of what the thrill is for those who participate in this practice. Gavazzoni does an excellent job of introducing her characters, so readers are not overwhelmed. I thought Edward, Simone’s clinical partner could have been more developed in that he was working on a case of finding a serial killer and provided insight into the case Simone is working on. Carl, the attractive lawyer, piqued Simone’s interest in more ways than one; however he presented himself as cold and not interested in getting to know her on a personal level. The journal was quite detailed in sexual events that occurred, but I found Simone’s over-analyzing to be a deterrent. Having worked in the psychology field for over 30 years, I know we tend to do this a lot. The story does flip flop between the past and present, but provides for a fast, can’t-put-it-down read. Gavazzoni also does a great job in describing some of Simone’s therapy sessions with client’s who range from dependent to those who feel the need to threaten her due to ill conceived perceptions. Readers will find this story fascinating. It’s educational about sexual paraphilias and full of plot twists and turns. 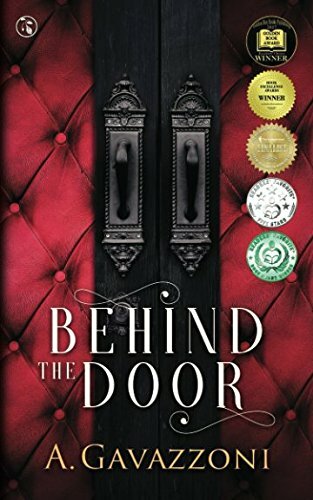 “Behind The Door” by A. Gavazzoni is well written and reads somewhat fast if you don’t get hung up on the descriptions of the sexual encounters and the over-thinking by the main character, Simone.